, a most accurate mechanic, the celebrated inventor of the famous time-keeper for ascertaining the longitude at sea, and also of the compound or gridiron-pendulum; was born at Foulby, near Pontefract in Yorkshire, in 1693. 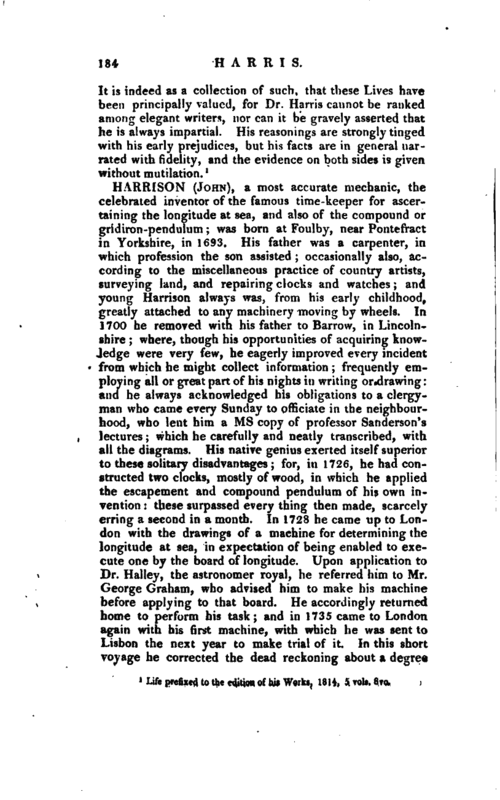 His father was a carpenter, in which profession the son assisted; occasionally also, according to the miscellaneous practice of country artists, surveying land, and repairing clocks and watches; and young Harrison always was, from his early childhood, greatly attached to any machinery moving by wheels. In 1700 he removed with his father to Barrow, in Lincolnshire; where, though his opportunities of acquiring knowledge were very few, he eagerly improved every incident from which he might collect information frequently employing all or great part of his nights in writing or drawing and he always acknowledged his obligations to a clergyman who came every Sunday to officiate in the neighbourhood, who lent him a ms copy of professor Sanderson’s lectures; which he carefully and neatly transcribed, with all the diagrams. His native genius exerted itself superior to these solitary disadvantages; for, in 1726, he had constructed two clocks, mostly of wood, in which he applied the escapement and compound pendulum of his own invention: these surpassed every thing then made, scarcely erring a second in a month. In 1728 he came up to London with the drawings of a machine for determining the longitude at sea, in expectation of being enabled to execute one by the board of longitude. Upon application to Dr. Halley, the astronomer royal, he referred him to Mr. George Graham, who advised him to make his machine before applying to that board. He accordingly returned home to perform his task; and in 1735 came to London, again with his first machine, with which he was sent to Lisbon the next year to make trial of it. In this short voyage he corrected the dead reckoning about a degree | and a half; a success which procured him both public and private encouragement. About 17 '69 he completed his second machine, of a construction much more simple than the former, and which answered much better: this, though not sent to sea, recommended Mr. Harrison yet stronger to the patronage of his friends and the public. 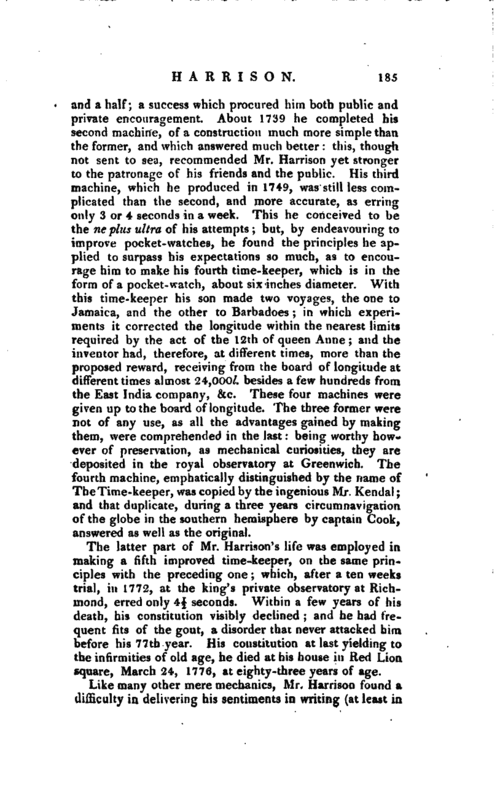 His third machine, which he produced in 1749, was still less complicated than the second, and more accurate, as erring only 3 or 4 seconds in a week. 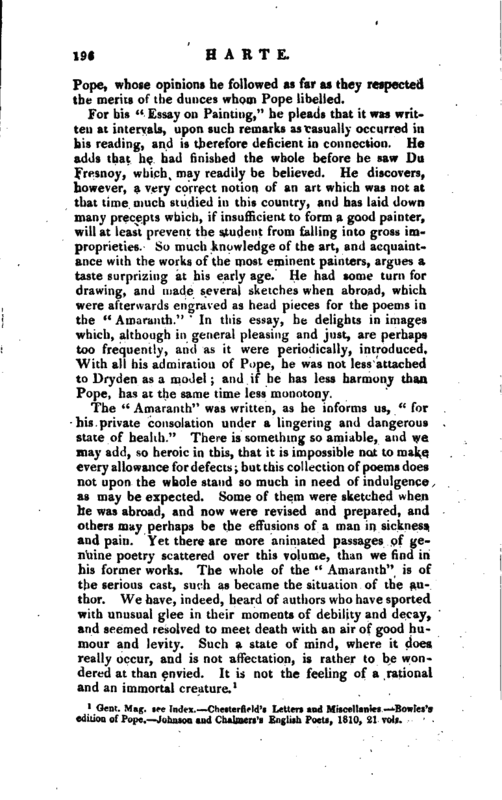 This he conceived to be the ne plus ultra of his attempts; but, by endeavouring to improve pocket-watches, he found the principles he applied to surpass his expectations so much, as to encourage him to make his fourth time-keeper, which is in the form of a pocket-watch, about six inches diameter. With this time-keeper his son made two voyages, the one to Jamaica, and the other to Barbadoes in which experiments it corrected the longitude within the nearest limits required by the act of the 12th of queen Anne; and the inventor had, therefore, at different times, more than the proposed reward, receiving from the board of longitude at different times almost 24,000l. besides a few hundreds from the East India company, &c. These four machines were given up to the board of longitude. The three former were not of any use, as all the advantages gained by making them, were comprehended in the last: being worthy however of preservation, as mechanical curiosities, they are deposited in the royal observatory at Greenwich. The fourth machine, emphatically distinguished by the name of The Time-keeper, was copied by the ingenious Mr. Kendal; and that duplicate, during a three years circumnavigation of the globe in the southern hemisphere by captain Cook, answered as well as the original. The latter part of Mr. Harrison’s life was employed in making a fifth improved time-keeper, o-n the same principles with the preceding one; which, after a ten weeks trial, in 1772, at the king’s private observatory at Richmond, erred only 4| seconds. Within a few years of his death, his constitution visibly declined; and he had frequent fits of the gout, a disorder that never attacked him before his 77th year. His constitution at last yielding to the infirmities of old age, he died at his house in Red Lion square, March 24, 1776, at eighty-three years of age. Ann. Register for 1777. Mutton’s Dictionary.